Meet John Wolfe and Joe Slack in September’s episode of Gallery, “Solid Art.” John Wolfe is an acrylic painter and wood sculptor who finds inspiration from his days growing up on a farm in Davidson, Oklahoma. He paints many farmhouses and regional Oklahoma architecture. Art enthusiasts have called John’s wood sculptures, “sacred.” He takes used wood and clay to make his work. He uses wood that is sometimes just lying around. He focuses on color and likes using older pieces of wood to get a nice aged hue. He uses clay to mold heads and hands to adorn the wood; the result is truly unique. His work is on display in galleries across the state. Joe Slack is a wood and metal sculptor who calls his work, “primitive, inspired, mid-century and humorous.” You’ll find his sculptures around the area on Classen Blvd, at the Infant Crisis Center, and in his large front lawn on a main road. He likes to finish a piece and display it in his yard right away, something he likes to call, “constant show and tell.” He takes time welding together his whimsical pieces like his popular sculpture series called the void series. There are lots of holes in these works to represent how everyone has a void in their life, or how everyone is dealing with something. 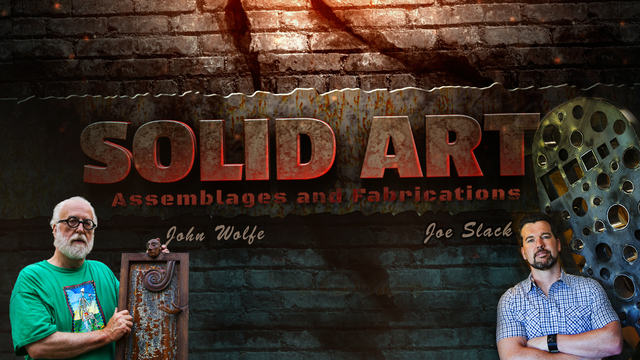 Don’t miss, “Solid Art” premiering September 11, at 7 PM on OETA.